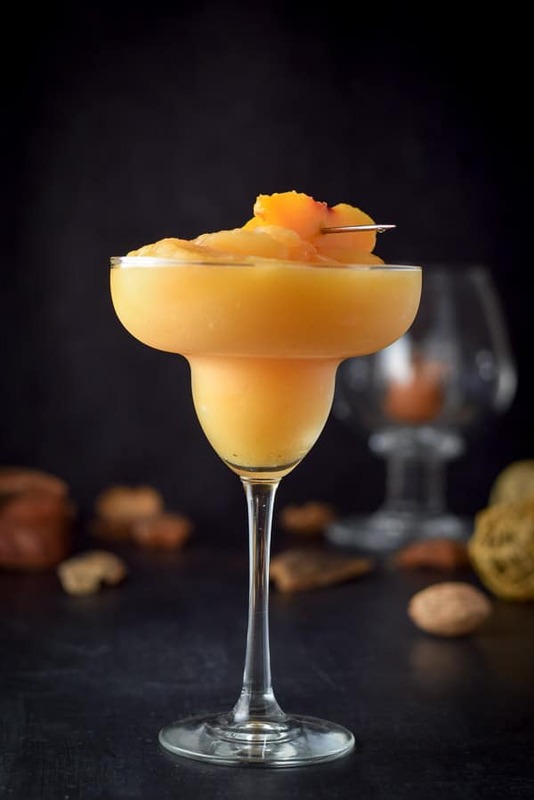 I love margaritas, especially this pretty perfect peach margarita recipe. Oh my, does it taste so yummy! It is slightly sweet and perfectly balanced. Surprised that I posted another margarita? No? Me either. Because I love margaritas so much. When I worked at the restaurant, I made many of these lovely peach margaritas for patrons. One thing I didn’t like was that we were made to use peaches drenched in syrup. Not that I haven’t eaten my fair share of peaches in syrup. I have. In fact, I have fond memories of my Nana, Bena, eating those peach slices plopped on shredded wheat cereal for breakfast. I love how slippery they are. And they have this satisfying crunch. It’s not the same as chomping on a fresh peach, mind you, but there’s a crunch just the same. Still, fond of them as I am, canned peaches are not my idea of cocktail fruit. One of the most memorable cakes my mom made involved peaches. My mom was having a dinner party one night. She made a peach flavored cake with white frosting and placed canned peach halves around the edges of the cake. 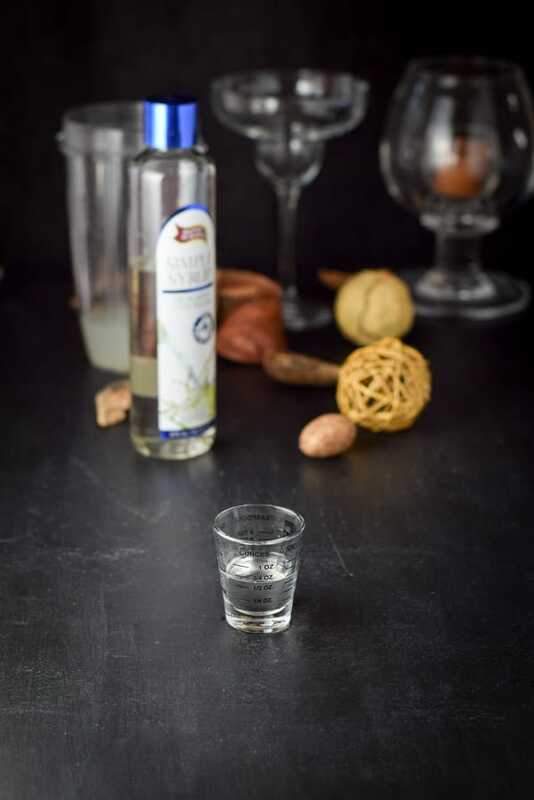 She then took some sugar cubes, soaked them in vodka and placed them in the curve of each peach half. When she was ready to serve that luscious cake, she lit each sugar cube on fire and brought the whole cake flaming to the table. The other peach trivia I want to relate is how my mom loved peaches, which was not the way other people love their peaches: ripe and juicy. No, my mom loved rock hard peaches. There was no way you were going to see any juice running down her face or hands. They were just too hard. You could hear her biting one and crunching on it from two rooms away! I like my peaches ripe and juicy. How do you like your peaches? I’d love to know. Leave me a comment. 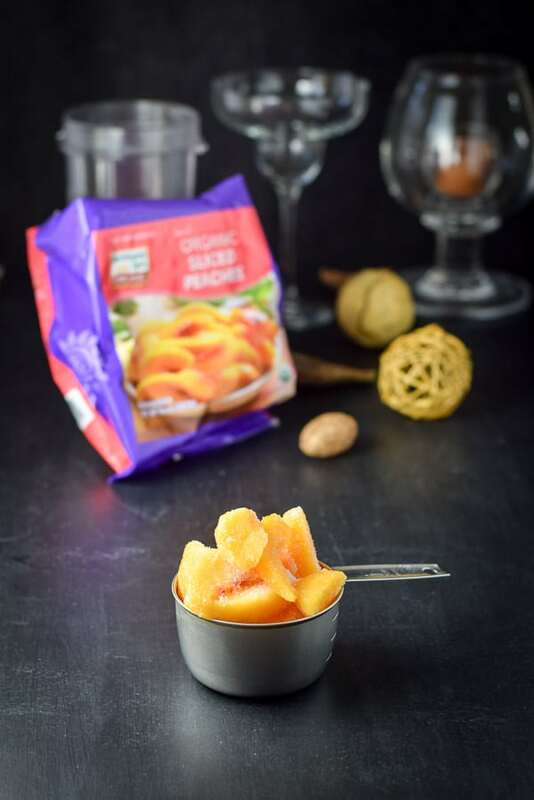 Unhappily, I couldn’t get fresh peaches in the grocery store for this post, so I had to pay an exorbitant amount of money for these frozen peaches. They were yummy, so I really can’t complain………too much. Propping up the bag of peaches is a bottle of Cointreau and peaking from the left side of the photo is my lovely Patron silver tequila. We also have some simple syrup and some lime. 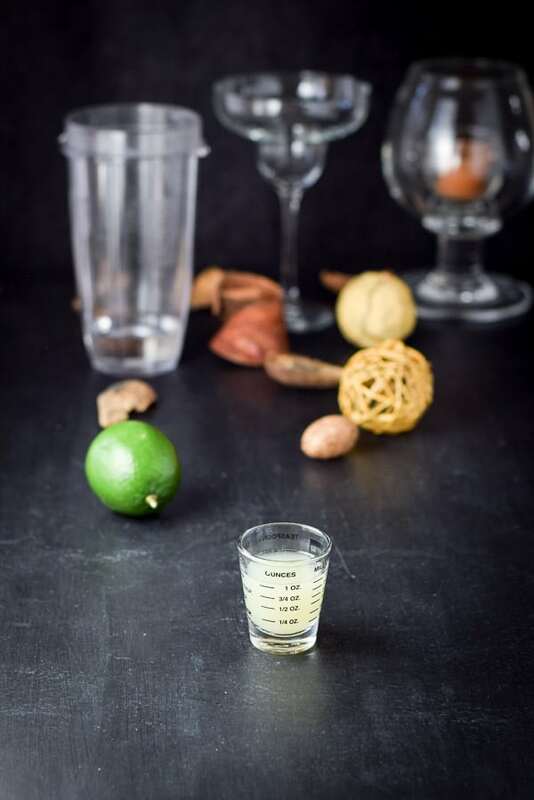 I grab my blender container and measure out two ounces of tequila. 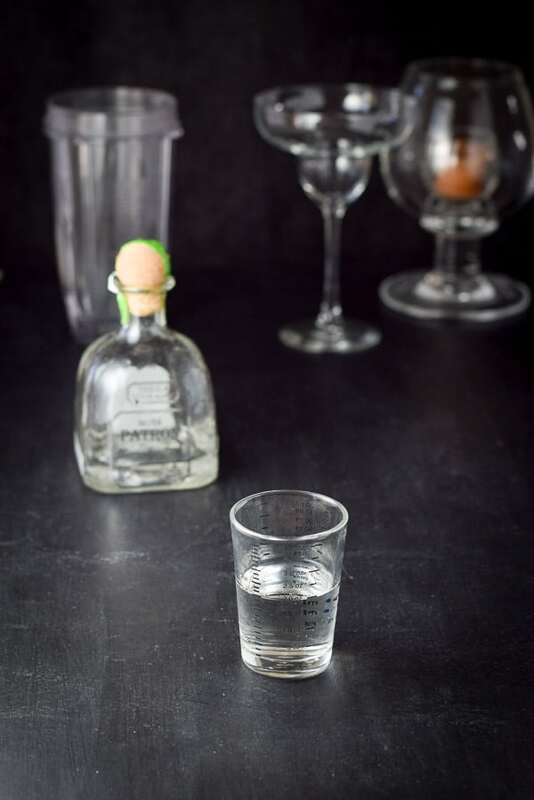 I pour the tequila into the container. 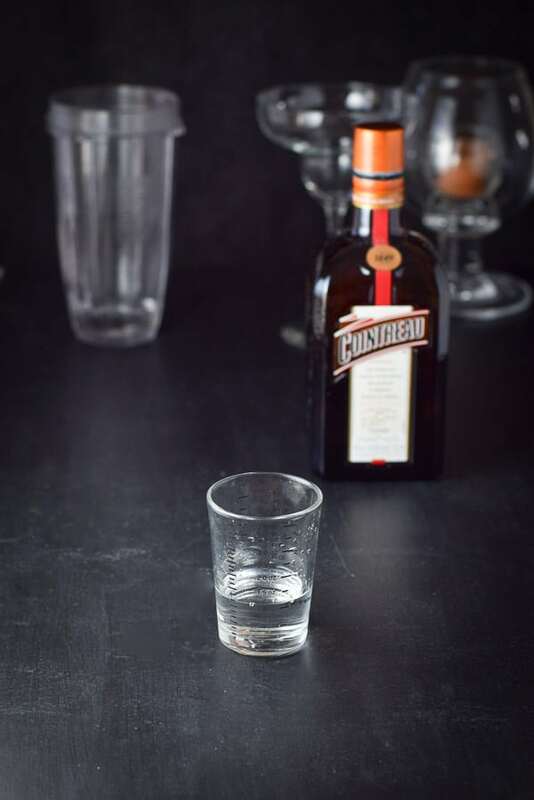 Next up, I measure one ounce of Cointreau. Into the container it goes to meet up with its good friend, tequila! Now for the lime juice. I squeeze out one ounce. I find that one medium sized lime, yields that amount. Then I pour it into the container. Now to sweeten it up a little. I measure 1/2 ounce of simple syrup. Into the blender container it goes. I take some frozen peaches and heap them into a cup measure. I’d say they are the equivalent of one normal or one and a half small peaches. I place them into the container and add one cup of ice. I screw on the top of the blender and pulse it until the ingredients are completely blended. Time to pour this lovely peach margarita into the glass. I also spear two peach slices with my martini pick and balance it on the peach margarita! Yum! Doesn’t that look delicious? Let’s look at a close up. And now for the vertical photo. Which photo do you like best? Inquiring minds would like to know. 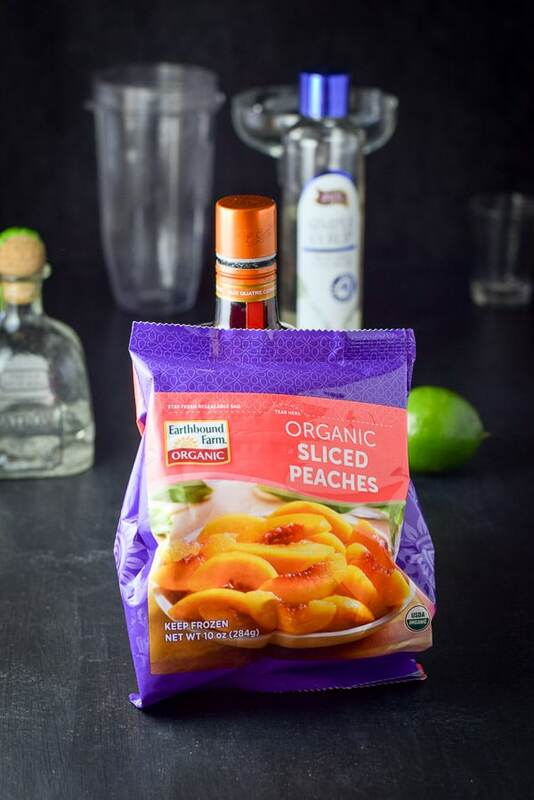 I hope you enjoyed this peach margarita recipe as much as I did drinking it. Soooo, good. 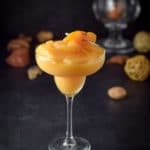 If you’ve tried this peach margarita or any other recipe on the blog, I’d love the hear what you thought about it in the comments below. I love hearing from you! You can also FOLLOW ME on FACEBOOK, TWITTER, INSTAGRAM and PINTEREST to see more of my delicious food and delightful cocktails! 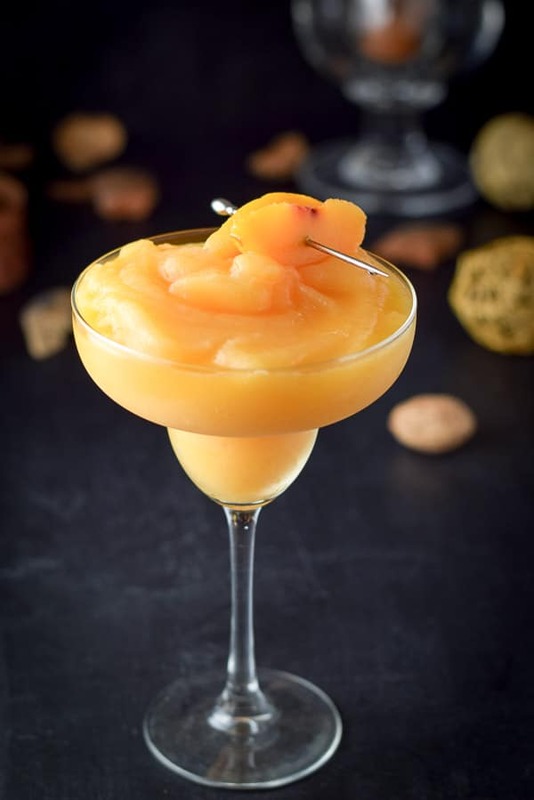 This frozen peach margarita is so refreshing and delicious! I love margaritas!! I cant wait till Cinco de Mayo to makes these!! Cheers!!! Deanna! Yahoo. It’s just around the corner! This is so pretty, and more importantly, it sounds absolutely delicious! I’m with you–the juicer, the better when it comes to peaches! This looks so pretty. Love the color and the combination sounds so DELISH!! Can’t wait to try. What a lovely margarita! So perfect with Cinco de Mayo just around the corner! Thank you Mary! I can’t wait! So pretty, so delicious, and so festive! I love a good margarita. 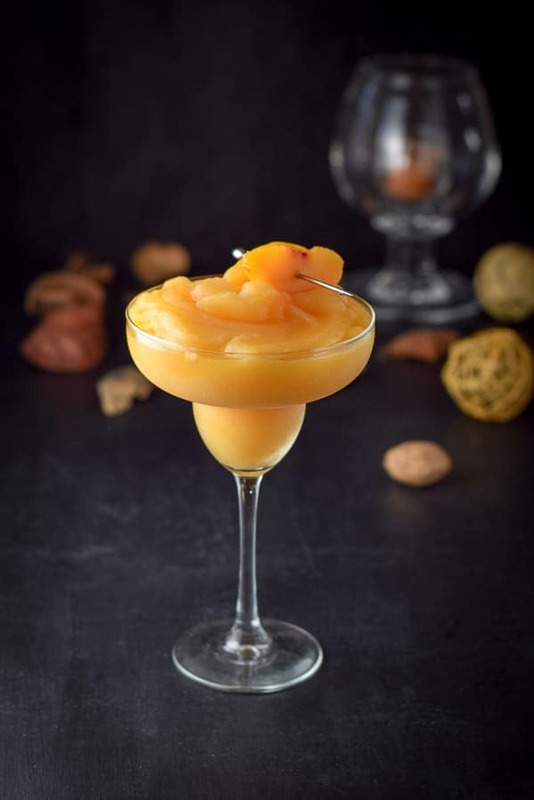 This peach margarita looks lovely! !